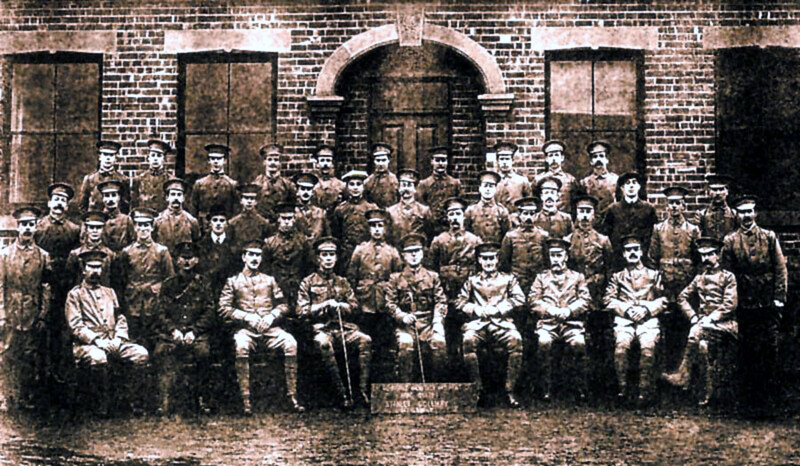 The photograph was taken, about 1916, outside the Mapperley Colliery newly erected office buildings "Nibby Pit" Stanley. Note: Mapperley Colliery Company 1914 logo over the main door (Keystone). The volunteers worked for the Company Collieries at Stanley and Mapperley. Living in the neighbourhood villages of Stanley, West Hallam and Mapperley. Several of the men went to fight in the Great War. Alfred Shaw ("Alf") and his parents came to Park Farm, Mapperley Village near Ilkeston, Derbyshire aged six and a half, on March 26, 1937, the day after Lady Day. Park Farm had until then a long association with the local coal industry, with its buildings sited at the bottom of the pit lane to Mapperley Colliery. employed to transport coal and materials on the tramways between the Blue Fly pit (complete with landsale wharf, South West of Mapperley Village), the small Simonfield pits (West of Park Hall Mapperley), and the Nutbrook Canal wharf some two and a half miles to the East. From here the coals from these and other local pits found their way to various markets by barge. The Park Farm stable boy inhabited a small two-story projection, which can still be seen at the Western end of the main Park Farm dwelling. The small scale coaling operations were superseded when the Glendon Coal and Iron Company of Leicester sank Mapperley Colliery in 1872 (known locally, like its much smaller predecessors as "Simon pit"), taking out leases on both Park and Park Hall Farms from Drury-Lowe. 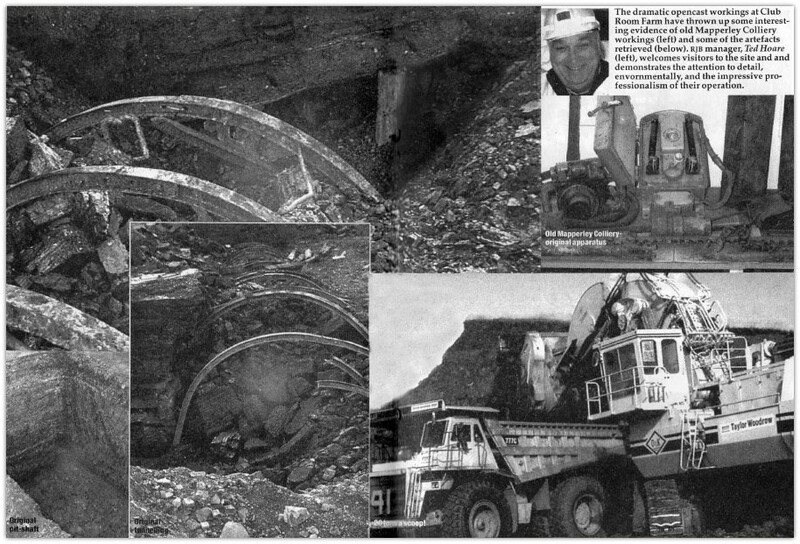 The three shafts at Mapperley Colliery penetrated all the seams from the Bottom Second Waterloo down, reaching the prized Kilburn Seam at a depth of approximately 1220 feet. In 1950 the economically recoverable reserves began to diminish however further investigations led to an underground borehole being sunk a further 625 feet to the Crawshaw sandstone. The major seams below the Kilburn (Alton, Norton and Belperlawn coals) were however found to be inferior in quality and thickness, and were not worked in the vicinity. Predominantly the role of the farms was to supply the 400-500 pit ponies and 11 shire horses with hay and occasional grazing. These animals were employed both above and below ground at Mapperley and Stanley Collieries (known locally as "Nibby"), the other mine of the then Mapperley Colliery Company. 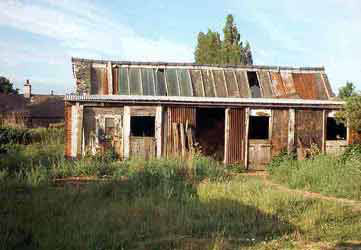 Park Farm itself had one of the outbuildings converted to a pit pony hospital, complete with half-glazed roof. 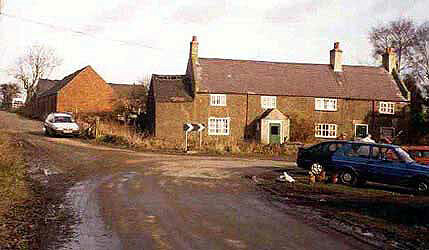 The colliery relinquished the Park Farm lease in 1935, at which time the main farm dwelling was inhabited by pit undermanager, a Mr. Hogg. From then on the Mapperley Colliery Company relied on Park Hall Farm and land towards Stanley in the South to provide for the needs of its ponies and horses. Pit pony hospital with some of the glazed roof still remaining. Alf's father took up the Park Farm tenancy in 1937, at that time with just a few dairy cows. Alf recalls that when his father and uncle came to view the farm in February of that year, they were confronted with 5-foot snowdrifts on their journey to "Cow Flat", a parcel of Park Farm land on the Eastern (opposite) side of Mapperley village. Although the new tenancy at Park Farm meant that it no longer had a direct association with providing for the ponies of Mapperley Colliery, its position meant that Alf and his family had direct exposure to the ongoing employment of these animals. The ponies would be taken from the pit at the end of May, the commencement of a two-week holiday period for the men. Underground animals would only have 10 days freedom in the open, as it would take some time to bring them to the surface and let them acclimatise as best they could. Likewise, there would be a period of roughly two days to round them up, and to get them back underground. These animals were naturally very boisterous with their change of environment. Many people might imagine that these few days in the open would have been the highlight of a pit pony's life, but Alf's father viewed it as cruelty. The animals were so conditioned to life underground, with so little lighting that they would emerge half-blind into the sunlight. Temperature and humidity, being relatively constant underground meant that if the surface weather was cold and wet they were unaccustomed to it and so suffered. If dry and bright their vision difficulties were exacerbated. Grazing fresh grass would also cause them to scour terribly. Other than these transient problems, Alf recalls that the ponies appeared very well cared for - or at least this was the case at Mapperley Colliery. Generally their coats were very thick, and this could be attributed to the fact that there was no natural moulting cycle. With the onset of WWII, things began to change rapidly within the coal industry. Demand increased massively, and there was a huge increase in mechanisation, including the pony's predominant role of haulage. Mapperley Colliery modernised rapidly, and soon had electric winders and underground machinery. By 1940 pit pony numbers were decreasing rapidly. Alf recalls pit ponies being culled by shooting at 20-30 at a time in the fields of Park Hall Farm. This was done on a Saturday afternoon when production had stopped, with most workers were out of the way. Nobody really cared, and there were no rescue organisations or sanctuaries in those bleak war days. This demise continued, and by 1960 there was only a handful of ponies left at Mapperley Colliery. Prior to closure in 1965, they had all gone. The dramatic Opencast Workings at Club Room Farm have thrown up some interesting evidence of old Mapperley Colliery workings (left of photo) and some of the artefacts retrieved. RJB manager, Ted Hoare (top right), welcomes visitors to the site and demonstrates the attention to detail, environmentally, and the impressive professionalism of their operation. 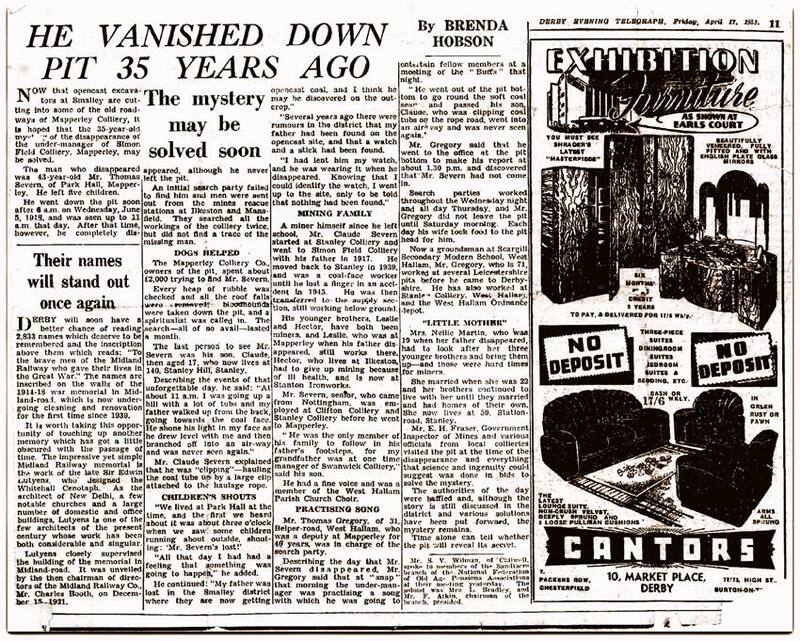 Back in 1918 a miner vanished; there was an extensive search of the mine but he was never seen again. 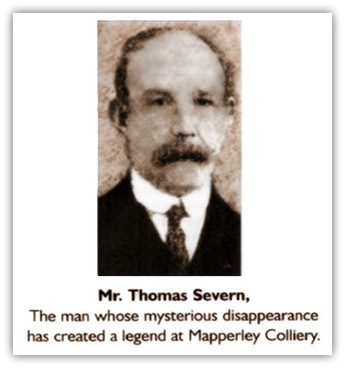 His name was Thomas Severn, Under Manager at Mapperley Pit. There were many theories at the time ranging from murder, to conspiracy, to his fleeing the country but despite police investigations we are no nearer the truth. Or are we? 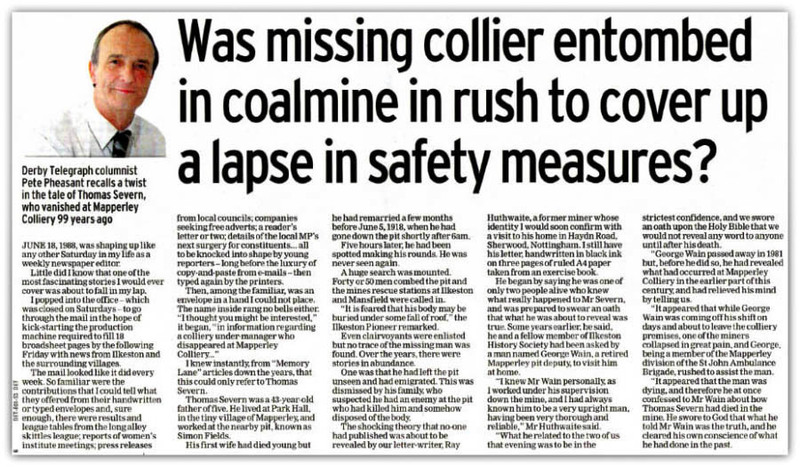 Hector Tyler, who was a miner at Mapperley pit, has investigated the disappearance himself. 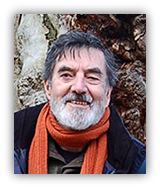 His research included interviewing miners, trawling through newspaper articles, studying maps of the workings, visiting libraries and using his own experiences as a miner to come up with a very plausible conclusion. 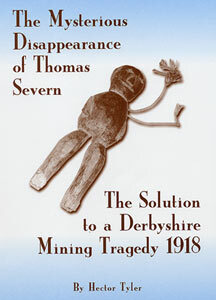 Apart from Thomas Severn's disappearance Hector also gives a lot of back ground information about the area around Mapperley, West Hallam and Ilkeston going back as far as the Doomsday book and giving an insight into what it was like to live in a mining community. In conclusion Hector's thoroughly researched book gives the reader some local history, community life, life as a miner and a mystery to ponder upon. The book is obtainable at News Express in Ilkeston as well as at the Erewash Museum in Ilkeston. The Ballad of Tom Severn came about in the Spring of 1966 when the mine was finally closed for good. I composed the song after research, reading reports and findings and was fascinated by the 1918 disappearance. I gave the first performance of my song at an Oxfam Concert in Ilkeston Town Hall and sang it again for the BBC Regional Extra programme on 18 April 1966. With the final closure of the pit and the original roads damaged by open-cast mining I guess the mystery remains.